People in Portland, Oregon are mobilizing to confront far-Right blowhard Jordan Peterson. 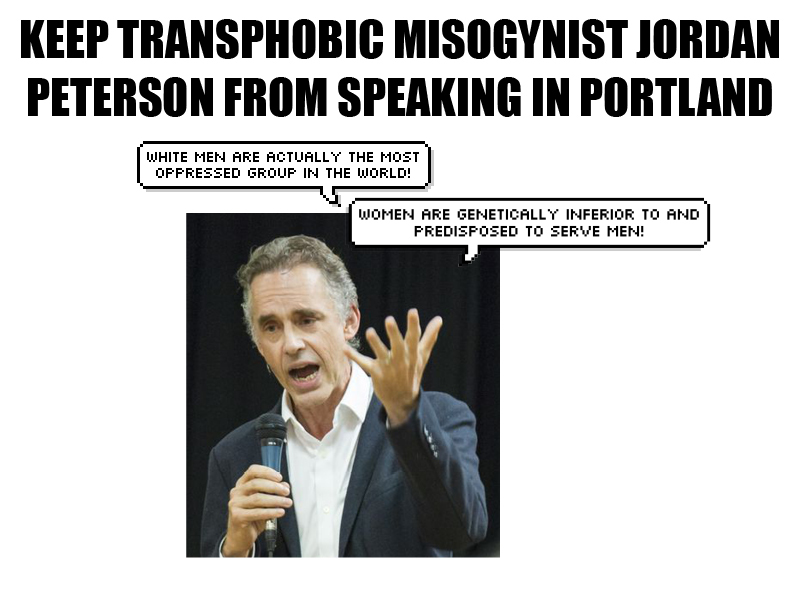 On June 25th, Jordan Peterson, a misogynistic transphobe, is scheduled to speak at the Keller Auditorium in downtown Portland. The organization responsible for booking him is the Portland’5 Center for the Arts. The Portland’5 is a non-profit funded in part by private donors and ticket sales, but also by the taxpayer funded Metropolitan Exposition and Recreation Commission (MERC). Porltand’5 Center for the Arts encompasses the Antoinette Hatfield Hall, Arlene Schnitzer Concert Hall, Brunish Theatre, Keller Auditorium, Main Street, Newmark Theatre, and Winninstad Theatre. MERC is responsible for managing the Oregon Convention Center, Oregon Zoo, Portland Expo Center, and Portland’5 Centers for the Arts. Funds for the Portland Metro, are raised by the events booked at these centers, as well as property taxes and local, state, and federal funding. On June 4th and 5th please join us in a call-in campaign and social media blast aimed at the Portland’5 and MERC to demand that Peterson not be given a platform with taxpayers footing the bill. Below is a template you can use in emailing, calling, or putting them on blast on their social media pages. To whom it may concern, I want to strongly urge you to cancel the Jordan Peterson event scheduled on June 25th. He is blatantly trans-phobic and patriarchy upholding. A misogynistic individual, hiding behind the guise of being a prominent intellectual and psychology professor. Peterson is not only a fraud, his rhetoric is also dangerous to the community at large. The views Peterson upholds and espouses serve as dog whistle calls to the alt-right and nurtures the twisted views of mass murderers like Alek Minassian and Elliot Rodger. The Portland’5 Centers for the Arts claims in their mission statement to “celebrate diversity and broaden access to the performing arts for people of all means cultures and ethnicities”. Peterson stands in opposition to everything celebrating diversity. I urge you to do the right thing, representatives of the metro community, and let Peterson know that he and his rhetoric have no place in Portland. Blast their facebook, twitter, and intagram! 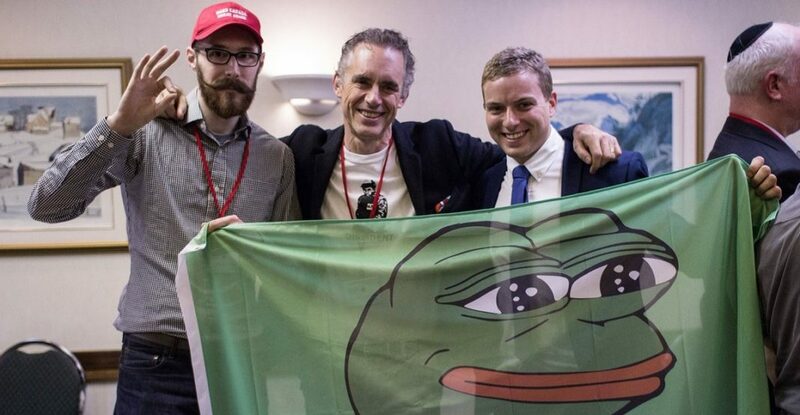 The following day, June 6th, members of a coalition formed to have the Jordan Peterson event canceled will be mobilizing to MERC’s meeting to voice public comment on this issue. Join us in a display of disapproval and to demand that these venues not support dangerous bigots. We will have talking points available for those who aren’t shy and would love to have as many others as possible to stand behind those who speak. The meeting is being held at the Oregon Convention Center in room A107-109. Public comment is schedule at 12:35 – 12:40, which is an indicator that this commission is not used to having public input at these meetings. Let’s show them we are paying attention. This coalition is being formed for the sole purpose of shutting down Jordan Peterson’s talk in Portland. We have the expressed agreement of bringing together groups and individuals who agree that a diversity of tactics is foundational in order to shut down bigots like Jordan Peterson. Stay tuned for updates and future call outs as organizing around this event is ongoing.